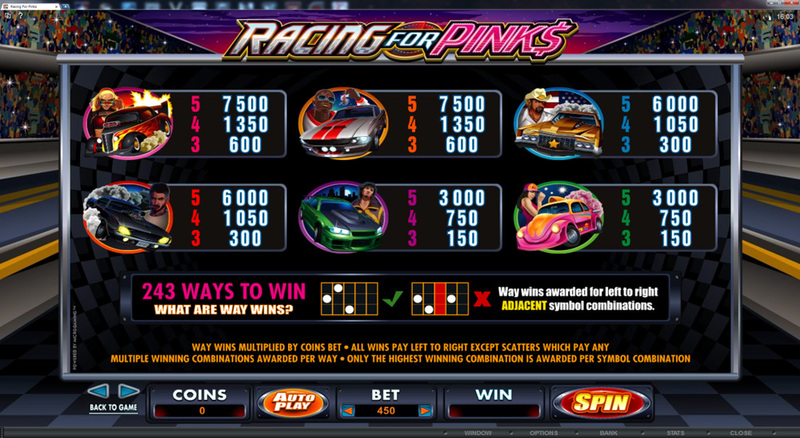 Racing for Pinks is one of Microgaming’s latest releases. This online video slot has a street racing theme, with plenty of colours and cars, and hot, flashy graphics splashed throughout. The brand new title, which was released in October 2013 is rapidly becoming popular with the online gaming community. The graphics don’t really do anything that we haven’t already seen before in other car themed video slots. Muscular and rough drivers, gorgeous babes, and engines are all typically included, many of which become animated when involved in a win. The gaming control menu, located at the bottom of the screen, is simple and easy to use. Clicking on the Bet button will pop up options to change your coin value as well as the number of coins bet per spin. Coin denominations range from a low of 1¢ up to a high of 20¢, and the player is entitled to wager up to 15 of these per spin. Ultimately, you can wager anywhere between the minimum of 30¢ per spin, and the maximum stake of $90 per spin. The number of paylines is fixed, as it is a 243-way slot. 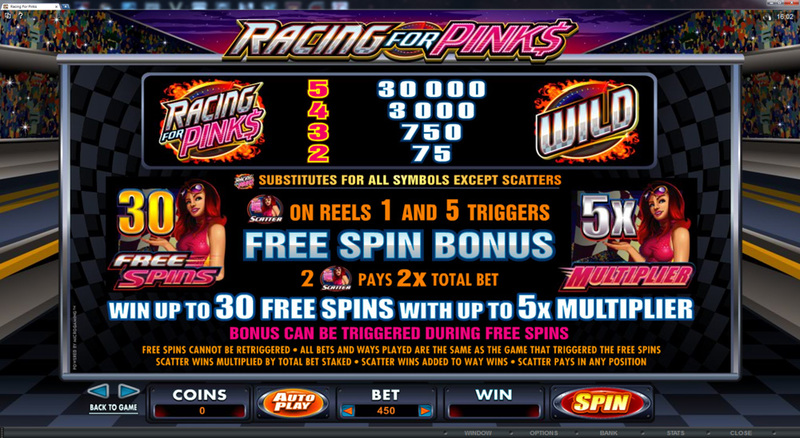 Racing for Pinks is a non-progressive jackpot slot, which is worth around 30,000 coins, for matching up 5 wilds on a payline. 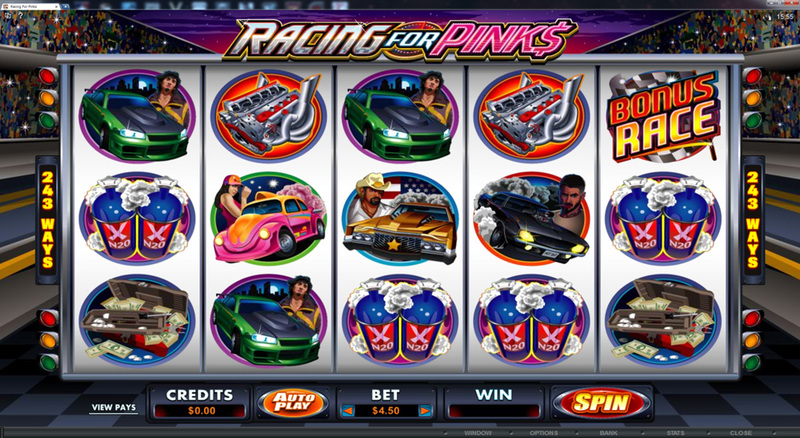 The wild icon in this title is the Racing for Pinks logo. As well as awarding the non-progressive jackpot, the wild icon can also substitute itself for all other symbols in the game, except for the scatter icons. The scatter icon, when landing on both the first and fifth reels, will trigger a free spins bonus. Here, the player can land up to 30 free spins, with up to a 5x multiplier. The player will never have less than 2x multiplier attributed to their winnings during a free spins round. Free spins can not be re-triggered, but the Bonus Rance can be triggered during the free spins round. Landing the Bonus Race icon on the first and fifth reels will trigger the Bonus Race. In this feature, the player can win up to 175x their original bet. In the bonus game, players must pick a racer, and hope that their racer goes on to win. If you manage to land 5 successive winners out of 5 successive races, you will win the grand prize in the bonus, the 175x multiplier. I can’t see myself playing this one a whole bunch. The few times I have played it, I found it really tough to hit either bonus feature. It’s tough enough to hit scatters on just the first and fifth reels, adding another scatter to those reels makes it even tougher. My most common complaint when playing a slot like this is that you can always get enough scatters to land, they’re just never all the right ones. You can find this new slot at any of these Microgaming Casinos.